When we were trying to work out (from 6,000 miles away) which American high school to send Gabriella to, we had three choices. In an effort to understand the schools, we possibly spoke to every single parent at each one. We chose the Urban School of San Francisco (“Urban” for short) because the same message kept coming up again and again. Every reference we spoke to said that Urban’s teaching was outstanding and that the school valued learning from first principles so that a student could understand why, and not just how. Well, from that point of view, our leap of faith has certainly resulted in a safe landing. The school is amazing. 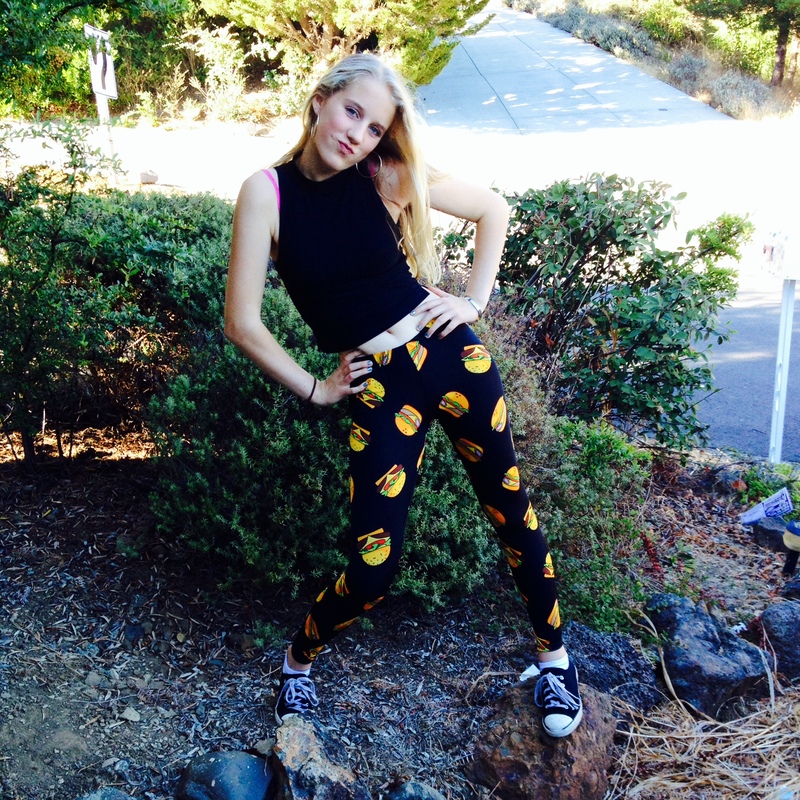 Yep, those really are cheeseburgers on her leggings! In History, students are expected to make observations and perform their own analyses from primary sources or personal experience. Gabriella’s class is studying 20th century Europe this term, so they’ve been covering the industrial revolution. They spent one whole 80-minute lesson under the tables so that they could experience the working conditions of miners (well, one aspect of the working conditions of miners). In another lesson, the teacher wanted the students to understand the significance of the introduction of factories, and what that did to the quality of the end product, so she split her class into two groups to make paper hats. One group represented the factory: each student added one fold to the paper hat and then passed it on down the factory line. There was no music and no talking. They just got on with their folding like robots. The other group represented the guild. The artisans in that group were responsible for whole hats each and they could chat and have music playing while they worked. The teacher could just have taught the kids that the factories produced more items of lower quality, while the artisans invested themselves in each of their products and produced fewer, higher quality hats, but she chose to let the students experience it for themselves and really take in that knowledge at a visceral level. Spanish lessons are also a whole-brain experience. They’re conducted entirely in Spanish, even though there are beginners in the class alongside kids that have been learning Spanish for a number of years. And it works. As the teacher explained to us at an information evening, the school emphasises the oral side of learning a language. It doesn’t serve anyone to be able to ace every written test, but not be able to converse, because you can’t wave your test results at a native Spanish-speaker and use them as proof that you can speak Spanish. As a result of this Spanish immersion, Gabriella already has a really good grasp of the language (and could understand a Spanish conversation that she overheard in Ikea last week!) and I have no doubt that she’ll be fluent at the end of her four years of this teaching. Maths is another subject that’s taught from first principles. Gabriella has always been good at Maths, but she’s never been confident at it. And that’s because she’s always been excellent at following a formula, without any clue as to why. So she’s always had good grades, but felt insecure because she doesn’t really understand how she got them. At Urban, students make their own discoveries in each new mathematical topic. And only after they’ve deciphered the maths on their own are they led towards a formula. So they can always repeat the process from first principles if ever they forget. (And having only 8 students in her Maths class also helps.) Her confidence level is significantly higher than it’s ever been before. This term, Gabriella’s only taking 4 subjects (these three and singing, which is unusual even for an American high school and worthy of its own post later on), so for every subject she’s taught, the school has shown a better way of teaching. That’s a pretty good hit rate. We’re happy with our choice.